I have been intrigued by this photo I saw on Pinterest. I thought it would be fun to try to do my own glowing Mason jars. I went to the blogsite credited with this photo but she was just trying to copy it too. She said she had not found exact instructions on how to do it but she tried with her son. Her results did not look like the picture but I think she and her son had a good time trying. I had also seen another post where Lisa of "Moore Minutes" blog had broken open glow sticks and dumped the contents of the glow sticks in a jar. They enjoyed the jars at a party for a few hours but they did not look like that first picture (not that she was trying...but that was another idea for me to try to get that effect). As summer winds down, I wanted to try the glowing jars. I decided to try the glow sticks and glow-in-the-dark paint. I painted the glow-in-the-dark paints first because the instructions say that the paints need to "charge" in the sun before they will glow at night. Even though I stirred each little pot of paint, they were pretty thin paints. I also used the larger bottle of glow paint to add more dots/squiggles. This was pretty time-consuming. I put the jar out in the sun to "charge". As it got dark, I got ready to open the glow sticks. They only have a "life" of about 4 hours. These are from the pack that has 8 glow sticks in it...2 of each color. There are instructions ALL OVER the package about NOT breaking the sticks open. There are warnings of dire consequences for your eyes, your skin, your clothes, your furniture if you should break open a stick. I did it anyway. Helpful hint: if you decide to ignore the warnings too to get at the glowing goodness, bend the stick first to break the tube inside the plastic so whatever ingredients are in there can mix together and activate. After getting the glow going on, I cut the tubes open one at a time. I tried shaking the cut tube into the jar trying to get the glowiness on the sides of the jar. The glowiness is very thin and did not stick to the sides of the jar. It slid down the jar and preferred to sit at the bottom of the jar. Helpful hint #2: the little glow sticks don't have much product in them. Go for the larger stick. I was hoping the larger glow stick contents would be thicker but they were not. So by this time, I have splatters of potentially dangerous glowing paint on my scissors, my dining room table, my fingers and I think some even got in my mouth. I grabbed some artist matte medium to try to thicken up the glowiness. Mixing in the matte medium with a previously cut glow stick. on the inside. It was tedious. The matte medium had not only made it thicker but it made the glowiness grow in size. I got a plastic vase and used some more on it as dots and squiggles. It still had not been used up. I hated to waste it so I just painted it solid on a clear plastic cup. I took all my glowing paint projects out into the dark expecting great things. I was VERY disappointed. I tried to take pictures of the various glow-painted items but they glowed SO little that none of the pictures even captured anything. I went to bed sad that I had spent two hours of my life on this project with almost no results. The only reason I am posting this is if I can keep someone else from trying the same things I did to create the jars that are in the Pinterest picture. It does appear that there is some type of light under the jars in the picture...I don't know if that plays into getting a better result. Due to the risks of cutting the glow sticks and time involved in "painting' it on the jars, I would not recommend the glow stick method to use with children. I may try to use more glow-in-the-dark paint on the other jar but my expectations are pretty low now. After I posted this I got some good suggestions from comments on how to achieve the glowing jar look. I had pretty much just given up before that but decided to try some of the suggestions. First of all, I bought 2 blacklight bulbs. Kinda scary on different levels. I bought two bulbs 'cause it was buy one, get one half off. If you want to try this, be sure you get the actual "blacklight" bulbs and not the bulbs that are black or the bulbs that are purple. Those will be less than $5 each but won't give the right effect. So, here are the latest attempts with some new products. They are pictured as they were with the blacklight nearby or in the room. Jar painted with glow-in-the-dark paint. This is the only hold over from the first night of trying. 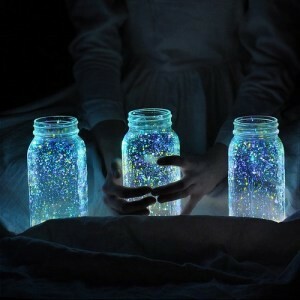 The jars painted with glow stick glowiness are long gone in the trash. Nana Diana suggested trying the irridescent gift basket shreds in the jar. I tried it in several of the experiement jars. The one above is the painted jar. This is the shreds by themselves put in a clear non-treated jar. This was very quick and easy. This jar painted on the inside with glow-in-the-dark face gel. This jar was sprayed on the inside with glow-in-the-dark hairspray. This is a glow-in-the-dark hair sprayed jar with irridescent gift shreds inside. John suggested a product that I have never tried before...aqua crystals. Florist and party planners use them as vase fillers. I found them at JoAnn's and Michael's in the floral section. They are just an amazing little product that looks like seed pearls in the package and then expands when exposed to water to look like cracked ice! Don't laugh but I saw glow-in-the-dark plastic "pony beads" at the craft store and wondered if something like beads (in the original picture) were suspended in the jar so I got some to try. The aqua crystals are promising to get "the look" but the "pony beads" are way too big for my purposes. This look might be fun for another occasion, however. Stonemaven suggested battery operated LED blacklights which I have not been able to find locally but they are on websites like "Blacklight.com". In researching that avenue, I found small blacklight flashlights available online. Guess what people use those for mostly...finding scorpions, cat pee, and counterfit money! I am becoming so blacklight "enlightened". This is a plastic jar GITD hairsprayed on the inside, then dotted on the outside with GITD fabric paint. It is not the exact look I want BUT it would be more kid friendly than some of the other techniques. The fabric paint was thicker than the original GITD paint I tried so I was able to make little dots and they did not "run". The small size of the paints (I used 3 different colors) was only about $1 each at JoAnn's. This picture is the jar with a blacklight in the room but these dots glow in a dark room even without the special light. Thank you very much to those who offered suggestions for products to try for the glowing jars. After these new experiments, I think the original picture did have a black light in it. I am "tripped up" on getting the exact speckles-on/in/suspended-with-the-jar look . Maybe some of the experimental looks would be fun at a party even. At the very least, I have the makings of a good Halloween with black lights and glow-in-the-dark beauty products. I do remember a few years ago, we left one of those glow sticks on the floor and our cat decided to try to chew it. Bad idea. The poor thing started foaming at the mouth and choking...it was horrifying. Luckily, he was fine, no harm, no foul, but I keep a much better eye on those things since then. THANK YOU for linking up to the tripped up party...it really really means a lot to me and I hope you come back next Thursday - I'll be featuring you!! I did a party using a technique where you use the glow sticks and immerse the contents in floral gel. You can find it in most craft stores. It starts out as hard pellets that you put in water. They swell with the water and look like cracked ice. this will suspend and also refract the light.In some of the containers I added color changing submersable lights to make an added magical look. tonic water glows because it has quinine in it. Mix it with either floral gel or piping gel from the baking section at your local store. Set the jars top of a glass shelf with a blacklight fixture underneath the glass. There is a lemon scented dish soap (don't remember the brand, but it was one of the cheaper ones) that is CRAZY black light reactive. I would think that leaving a tray of it out to reduce the liquid would make a pretty thick product that could be used like paint. It is only one color, but could work. I remember pinning this project on pinterest. I thought it mentioned something about glitter being involved? the only reason I didn't try it was because I couldn't imagine how you would manage to coat the glitter with the glowstick juice and then get it to coat the inside of the jars all speck-like. I figured it would just clump up. Anyway, just thought I'd mention it since you haven't mentioned glitter anywhere.